added some quilling and created my favorite card shape - easel. Anyway you can see all the details and descriptions, more views etc by clicking on any card image or you can go directly to my website here. I'm using one of the newest stamps("Friendship isn't a big thing...") from Quietfire Design - I know I'm going to be using it a lot BIG GRIN. I'm also using one of my favorite birthday stamps (7pce set) and part of a companion stamp. So lovely! When I first started papercrafting I did quilling so I'm thrilled to see it here. Thanks for joining us at Little Red Wagon. Love this card!! Great flowers, fantastic stamping!! 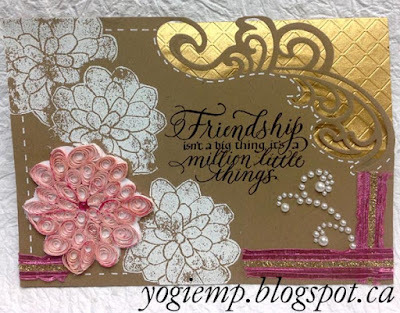 Your card is gorgeous; love the die you used and your quilled flower is beautiful. Thank you for sharing with us at MFP Speedy Fox & Friends Challenge. What a gorgeous card!! Love the pretty flowers!!! Thanks for joining us at “Simply Create Too”, hope to see you next time again. Your card is absolutely stunning, I love the die. Thank you for joining us at MFP Speedy Fox & Friends. Gorgeous! Wow! Love that corner cut out! Love the design of your card!!! Beautiful work. Thanks for sharing at MFP SF&F challenge. Fabulous card - beautiful design. This is such a beautiful card! I love the thoughtful detail that is part of the design. 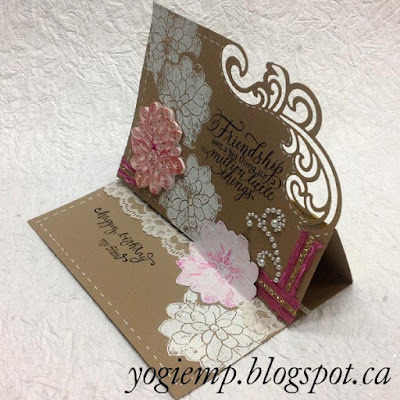 Thank you for joining us at Fashionable Stamping Challenges for our 100th challenge. Such a Lovely card!! I love the colors and the elegance! Thanks so much for playing in our Friendship Friday Funday challenge this week! Wonderful card love the colours and the carved peony is gorgeous. Thanks for joining us at Southern Girls. Gorgeous card! Thanks for joining us this week at HIMCR! Stunning creation thanks for joining the frame it fun over at Polkadoodles and good luck. This is beautiful. Love that sentiment and flourished corner. Thanks for sharing at MFP's Speedy Fox and Friends.